Larger breakfast option than expected. 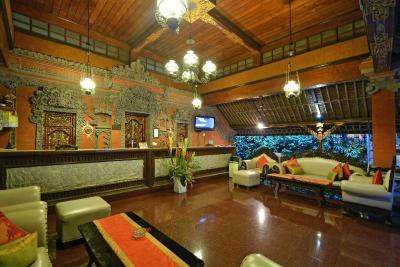 Older style Bali hotel so don't expect the Ritz but excellent value for money. The room was much larger than we expected, and the shower/water pressure was excellent. Very comfortable bed. Nice and quiet inside the room. Nice gardens. Breakfast was adequate, and well presented. Unlimited coffee refills! Nice deep pool with a shallow area for kids. Room size was very big. Hotel decoration super nice by Balinese architect I love this. Very helpful and kind staff. 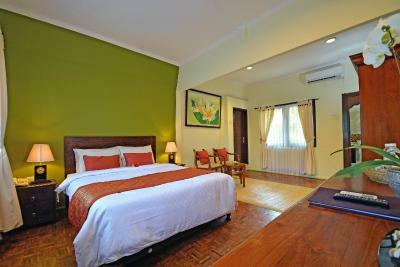 Ample breakfast and comfortable large rooms. Excellent location. 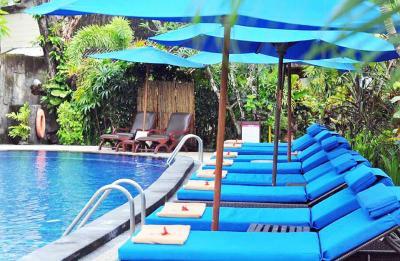 Beautiful pool and reasonably priced menu for meals poolside. 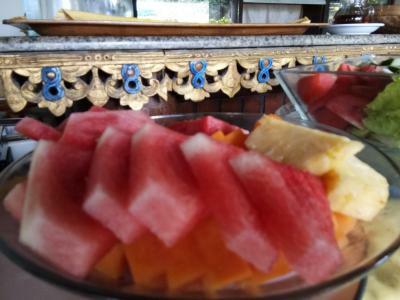 - Very nice staff at the restaurant - beautiful room, great value for money - beautiful hotel with old stone sculptures, traditional Balinese flair, stunning wood-carved doors, lots of flowers.. We loved it! 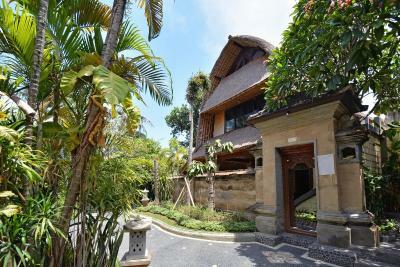 This location with its traditional Balinese flair, wood carvings, statues and flowers everywhere is truly beautiful!! We liked it so much that we came back for a second stay :) Staff was really friendly, too. 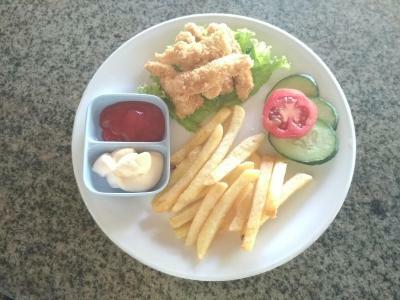 I liked the breakfast real value for money and just right. 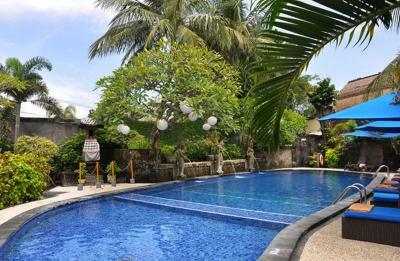 Overall very good, pleasant settings, nice pool, restaurant on site good and massage spa great value. 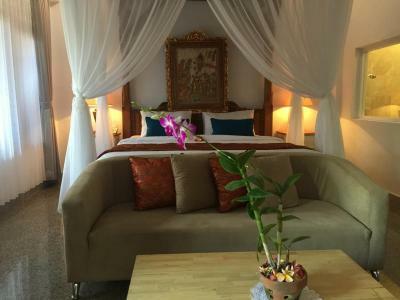 Puri Dewa Bharata Hotel & Villas This rating is a reflection of how the property compares to the industry standard when it comes to price, facilities and services available. It's based on a self-evaluation by the property. Use this rating to help choose your stay! 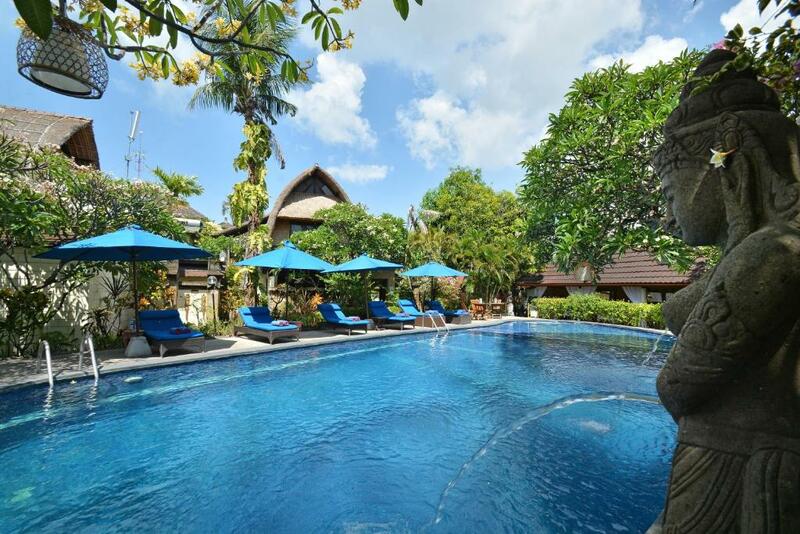 Nestled within a landscaped garden, Puri Dewa Hotel is located strategically 10 minutes' walk from Double Six Beach in Seminyak. 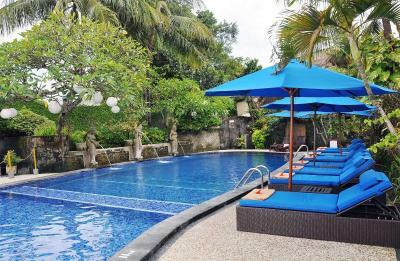 Featuring modern Balinese-style furnishings, it offers well-appointed accommodations, an outdoor pool and free WiFi. 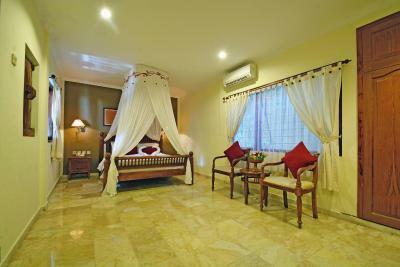 Airport pick up service at an additional charge and a free scheduled shuttle service to Kuta are provided. 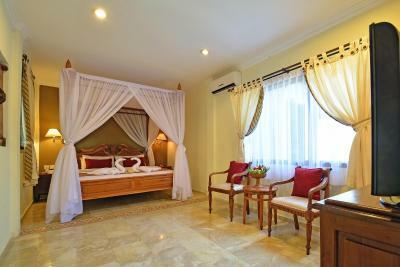 Puri Dewa Bharata Hotel & Villas is a 25-minute drive from Ngurah Rai International Airport, while Legian Beach is about 0.6 mi away. Popular attractions like the Petitenget Temple is 1.9 mi from the hotel. 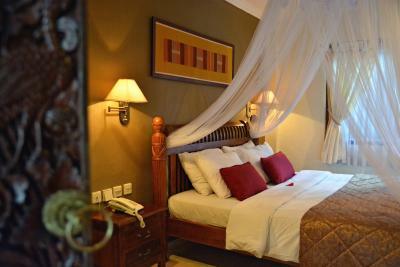 The elegant guestrooms are fitted with carved wood furnishings, warm lighting and artworks. 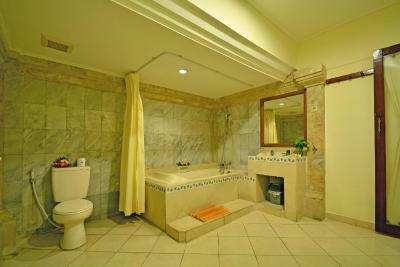 Bright and spacious, they have private balconies, ample seating area and modern bathrooms with bathtub. 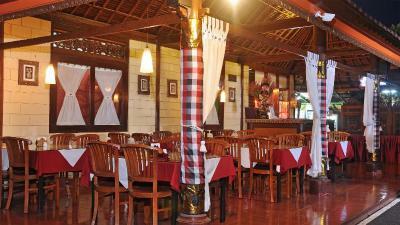 The on-site Saraswati Restaurant offers all-day dining. 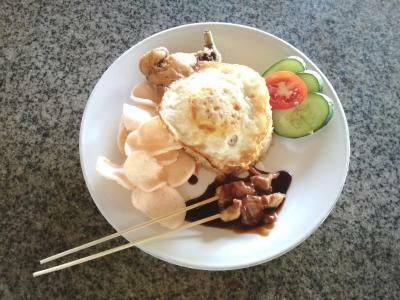 Alternatively, guests can sample local specialties at the many eateries located within a stroll from The Puri Dewa. 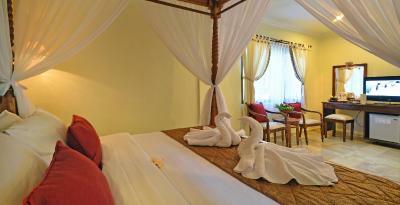 The hotel provides massage services, car rental facilities and a tour desk. Laundry and dry cleaning services are available. 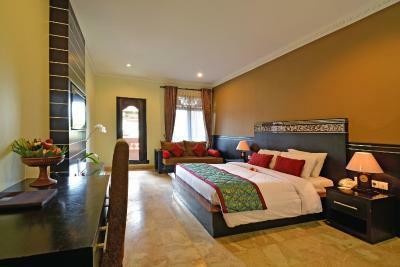 When would you like to stay at Puri Dewa Bharata Hotel & Villas? 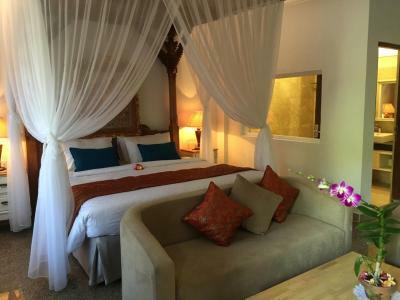 This room has air conditioning, a satellite TV and a mini-bar. 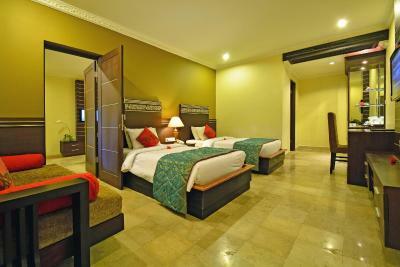 Guests staying a minimum of 4 nights get free airport pick up only service. Please provide the hotel with flight details upon booking. 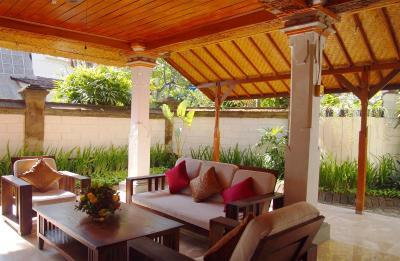 Spacious villas feature a separate living area. 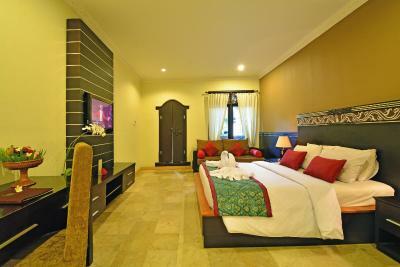 Rooms feature modern furnishings like a wall-mounted flat-screen TV. Features a spacious living area. 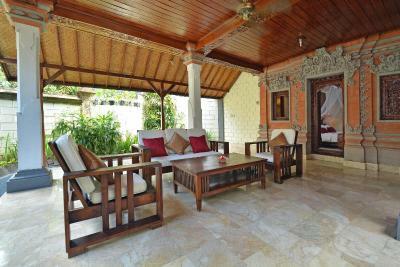 This spacious villa consists of Downstairs Villa with double bed and Upstairs Villa with twin beds. 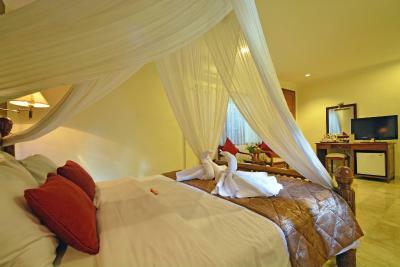 Each bedroom is air-conditioned and fitted with wardrobe and private bathroom featuring shower facility. 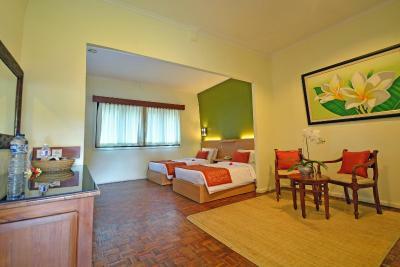 This twin/double room has a electric kettle, seating area and mini-bar. 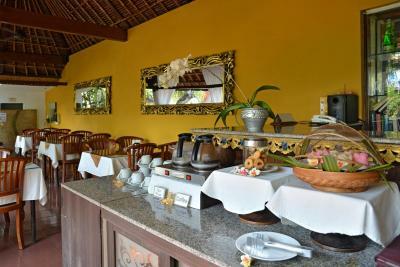 Puri Dewa Bharata Hotel and Villas, set in landscaped tropical garden,posses the ambient of charming traditional Balinese Village concept. Nestled in the borderland of Seminyak, Puri Dewa Bharata is close to shops, restaurants, and colorful nightlife entertainments. 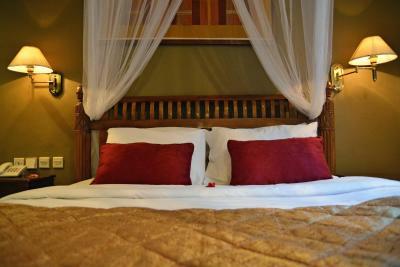 The hotel offers a comfortable stay in quiet presence and relaxing atmosphere. 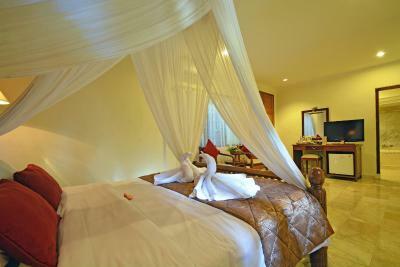 Boasting total of 48 rooms, all villas and rooms are decorated in Balinese style. 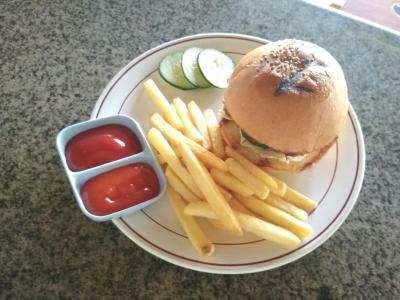 Come and stay with us, our Balinese friendly staff is at your service around the clock to make your holiday relaxing and memorable. 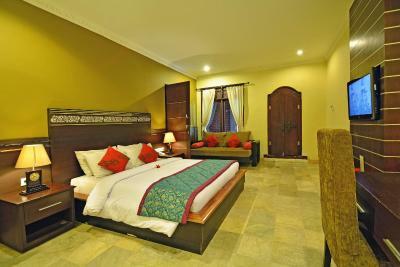 House Rules Puri Dewa Bharata Hotel & Villas takes special requests – add in the next step! 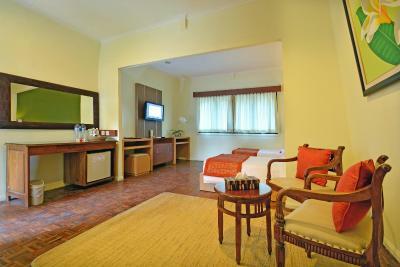 One child under 2 years is charged IDR 65000 per person per night in a crib. 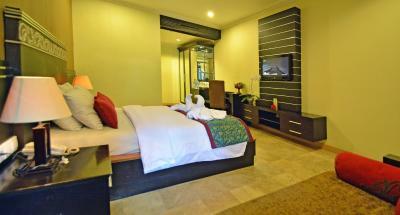 One older child or adult is charged IDR 185000 per person per night in an extra bed. Puri Dewa Bharata Hotel &amp; Villas accepts these cards and reserves the right to temporarily hold an amount prior to arrival. Puri Dewa Bharata Hotel & Villas accepts these cards and reserves the right to temporarily hold an amount prior to arrival. Please present the same credit card used to guarantee your booking when checking in/making payment at the hotel. 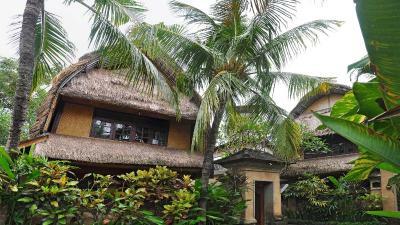 Loved the old style Balinese feel and the gardens. Great pool. The management staff, kitchen staff and reception are not nice. Too arrogant! Except the lower level staff who are very friendly. This hotel needs clearly a training in customer service! Towels are stinky because they wash them with cold water. The hotel is also located next to a busy road. 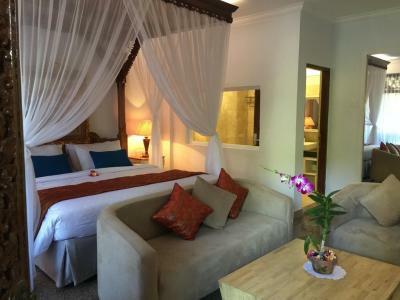 The hotel is beautiful in Bali Style! Felt like hotel trying to save money on linen and laundry. Warn out pool towels. Bathroom taps and showers with Soap marks. Cleaning must be hard due to age of the hotel. Atmosphere I the hotel and pool area. Good breakfast. I don’t like the curtains in the bed, it’s so dirty I believe it never clean . I don’t know why you put your dirty things for your decorations. The look outside the garden. Aircon was poor in our room but we were moved when we complained. Bathroom in first room very tired and cracked. 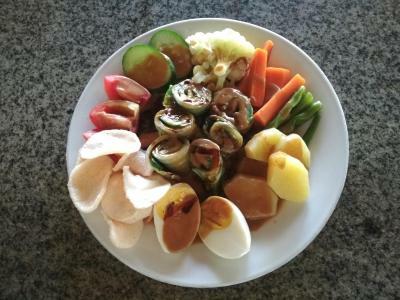 The property is located walking distance from the shops, cafes and restaurants. 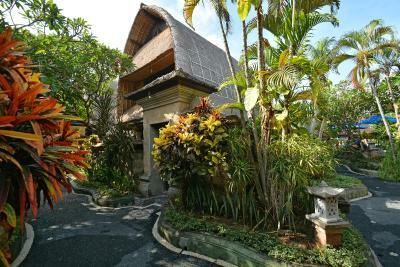 Kuta, Sanur etc are a short taxi ride and it doesn’t cost much. A short walk also to Seminyak beach. The family units are very spacious and cleaned every day. Bottled water was supplied for each person every day (complimentary or free). 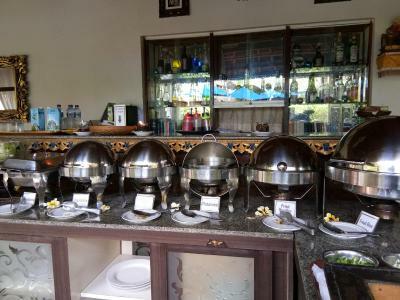 Breakfast buffet was delicious and plenty to choose from. Pool towels are provided and the pool was great for cooling off on hot days. All the staff were so friendly, smiley and helpful. Beaut pool, lovely staff, a real mid range Gem with ornate and traditional architecture. The cleanliness of the space was poor. The table cloths at breakfast had stains all over them. The bathrooms were basic and and shower curtain had mould stains on it. If there was a little more care taken over these elements then it would make the whole thing feel better We had issues with taxi costs from the airport as there is only 1 shuttle bus per day from the hotel. We arrived late at night from the airport. Our taxi driver tried to charge us $550,000 for the trip (the expected trip was between $100,000 and $175,000) so $55AUD instead of $17AUD. when we refused to pay and asked the staff to tell us what we should be paying maximum they were reluctant to help negotiate with us, they didn't want the confrontation which is fair enough but it is nice to know that your hotel has your back in these situations and want to protect us instead of ignore it. I realise this is personal and it is not the reception staff fault but it was just a difficult way to start our stay and was worth mentioning. Overall a really nice feel to it. 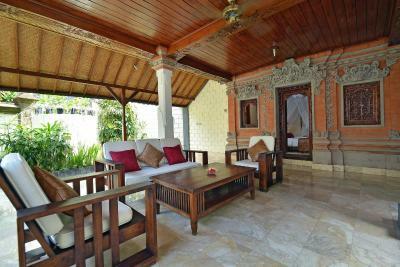 The best bit was that the whole space felt very traditional and Balinese which was a treat! Our front door to our room was beautifully calved wood. The pool area was nice and quiet and relaxing. You get what you pay for - it wasn't heaven but it was spacious and comfortable (mattress was great!) and practical. The toilet at the room was a bit smelly , please chek. 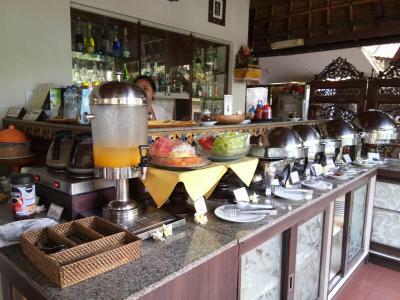 Friendly staff, good breakfast fine location, big rooms and will go back next time.